IRISHMAN ALAN KELLY has been named MLS Referee of the Year for 2018, picking up the award for the third time in four seasons in the USA’s top-flight. The Cork native served as a League of Ireland referee for 15 years but moved Stateside in 2014. He received 54.49 per cent of the player vote, 43.14 per cent of the media vote and 41.67 per cent of the club vote this week, which gave him an overall average of 46.43 per cent to pick up the accolade. The 43-year-old, who played schoolboy football with local side Avondale United and Cork City, was also named MLS Referee of the Year in 2015 and 2016 and will officiate the MLS Cup final between Atlanta United and Portland Timbers on 6 December. “I’m delighted to see Alan Kelly named as our MLS Referee of the Year and Joe Fletcher as our MLS Assistant Referee of the Year,” Professional Referee Organisation General Manager Howard Webb said. “They are excellent ambassadors for PRO and provide strong examples of the professionalism of our group, both domestically and internationally. Since being accredited by Fifa in 2002, Kelly has also gone on to referee top level international fixtures, overseeing matches in the 2006, 2010 and 2014 World Cups. Email “Cork's Alan Kelly named MLS Referee of the Year for third time in four years”. 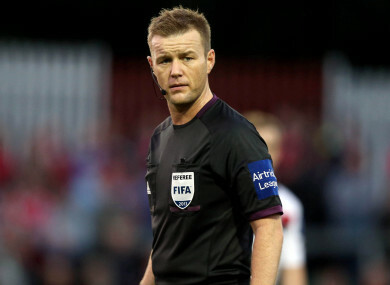 Feedback on “Cork's Alan Kelly named MLS Referee of the Year for third time in four years”.